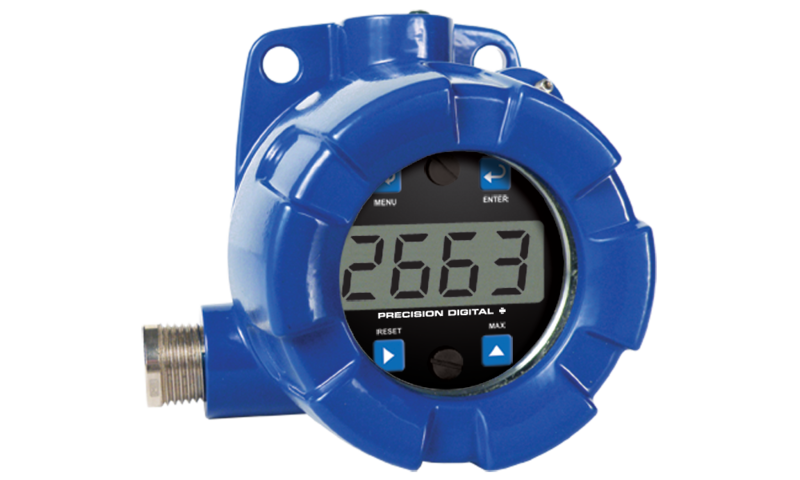 The PD663 is a loop-powered field meter that is FM Approved and CSA Certified as Explosion-Proof, Dust-Ignition Proof, and Flame-Proof, and ATEX & IECEx Certified as Flame-Proof and Protection by Enclosure. The PD663 is easy to install and program and it can be seen in a variety of lighting conditions and even in bright sunlight. The fact that this meter is loop-powered means that there is no need to run additional, costly power lines into a hazardous area. The meter gets all of the power it needs from the 4-20 mA loop and its 1.7 V drop results in a minimal burden on the loop. The meter features a wide -40 to 75°C operating temperature range and comes with two 1/2" NPT threaded conduit openings and flanges for wall or pipe mounting. Calibration is a quick process involving the four internal push buttons. The PD663’s display will read up to 2999; we call this 3½+ digits! Programming Method: 4 Front Panel Pushbuttons (behind glass). Magnet may also be used for programming; P/N PDA-MAG. Enclosure: Explosion-proof cast aluminum with glass window, 0.30% max copper content, corrosion resistant powder coating, color: blue. NEMA 4X, IP68. Two ½" NPT threaded conduit openings. One ½" NPT nickel plated brass conduit plug with 10 mm hex key fitting installed. Mounting: May be mounted directly to conduit. Two mounting holes for 1.5" pipe or wall mounting.